What is the most repulsive insect you can think of: a cockroach or the Huntsman? They may be creepy but nothing is more disgusting than a small, creamy, putrid worm called the maggot. If you need to book you can in under 60 seconds. Or check out our competitive packages. 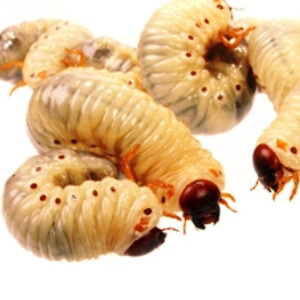 Maggots are easily recognised by their white – creamy body shape. The slender end that narrows to a point is the head; while the blunt and thick end is the rear. The hook-like mouthparts are the only visible part of the head of these flies. The rear end of the maggot has two kidney bean shaped patterns on the end; these are small openings used for breathing called spiracles. These are designed to eat dead tissue! During the warmer months, the fly breeds in large numbers. Flies possess special sensory cells on their antennae and feet which allow them to identify suitable food and potential breeding ground. The sensory cells help the fly detect ammonia, carbon dioxide and other compounds that are released from decaying flesh and faeces. Therefore, maggots will only exist if the adult fly has found access to the food source, commonly in your rubbish. The adult fly lays eggs, usually in a rotting and moist environment, like food! The eggs hatch within 24 hours and begin to feed on the food. 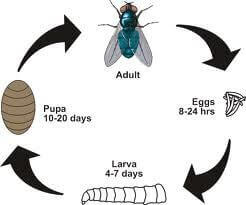 This is the main feeding stage of the fly. The larvae are 2 mm in length and continue to grow until they reach about 15mm. Maggots generally move in a straight direction away from the food source during post feeding stage. If you see maggots, it is safe to assume that expired food or dead animal is nearby and has been left unattended for some time. The numbers of maggots are a good indicator of the amount of food source. Be sure to observe the direction that the maggots are coming from. Keep in mind that maggots can travel quite a distance from their food source so don’t be discouraged if you do not find the source. If you do find the food source, ensure you wear gloves to avoid any infections or disease.